How Many Ways Are There to Be Sensitive To Gluten? Coeliac disease (CD) is an (auto)immunologically mediated intestinal intolerance to gluten (and associated cereal proteins) resulting in damage to the intestinal mucosa and decreased absorption of nutrients from food. ‘Tissue Transglutaminase’ (tTG) has been established as the autoantigen in CD. Incidentally, the normal physiological function of Transglutaminase has been posited to be the repair of injured or inflamed tissue by cross-linking extracellular matrix proteins in the tissue, thus stabilising damaged tissue and protecting the surrounding tissue from further damage. Researchers in Norway believe that Transglutaminase facilitates the physical linkage between the carboxamide-group of the amino acid Glutamine on a Gluten sub-fraction like gliadin, to an epsilon-amino group of a Lysine residue on a tissue Transglutaminase enzyme in the intestinal tract. Since gluten has an abundance of the amino acid glutamine, it is especially vulnerable to this reaction with Transglutaminase. This abnormally linked complex molecule is then perceived as a foreign antigen by the immune system and antibodies to tTG begin to be produced, inhibiting the normal function of Transglutaminase in repairing damaged intestinal mucosa, causing widespread inflammation and damage throughout the digestive tract. Symptoms may include obvious digestive complaints such as diarrhoea, abdominal distension and failure to thrive, but more insidiously, over the long term, signs include nutritional deficiencies, arthritis, short stature, discoloured dental enamel, additional autoimmune conditions, depression, premature degeneration of the nervous system, seizures etc. Despite the prevalence of Coeliac Disease having grown to over 4 times what it was only 50 years ago (independent of any increase in diagnostic sensitivity), it is still estimated that as much as 90% of coeliac disease still currently goes undiagnosed. The indication of Coeliac Disease is clearly often not apparent, nor is it easily confirmed once suspected. The obvious and immediate signs may not present themselves until many years of disease progression has already taken place, and seemingly unrelated pathologies are often not correctly attributed to Coeliac as their driving cause. Whilst the ultimate diagnosis is traditionally based on the histological analysis of small intestinal mucosa obtained via tissue biopsy, the assessment of auto-antibodies (anti tTG) in patient’s serum has been shown to provide substantial assistance in the detection and evaluation of CD. However due to certain circumstances that bring some variability to the sensitivity of tTG as a categorical marker of CD, (especially in children and IgA deficient individuals), further markers have been pursued to arrive at a universally and satisfactorily robust serological test for CD. Additionally, in some cases anti-gliadin antibodies are produced by the body against the disease-provoking gluten proteins themselves. Despite their initial widespread use, these antibodies have lost some of their diagnostic importance in CD due to their poor specificity for CD specifically, however this conclusion may have overlooked and cast aside an entire, potentially far greater, further subset of the population that clearly do have gluten related pathology, albeit not ‘true’ auto-immune mediated Coeliac Disease. This group have finally begun to be recognised under the emerging category of Non-Coeliac Gluten Sensitivity (which includes numerous such non-autoimmune mechanisms for sensitivity). Recently it has been found that gliadin antibodies from the sera of patients with active CD preferentially recognised deamidated gliadin peptides (DGP). Assessing deamidated gliadin peptides represents a new insight into a species of antibodies which are quite different from that of conventional gliadin antibodies as well as from autoantibodies and is expected to provide new information on the pathophysiological mechanisms of CD and associated immunodisorders. Some level of gluten exposure is still required however, DGP can still be detected in 80% of gluten responders. No single marker however, has a perfect sensitivity or specificity for CD. Whilst tTG tests performed correctly have shown relatively high specificity and sensitivity, some populations and especially young children have shown considerably higher detection sensitivity for CD via DGP (and to some degree anti-gliadin antibodies). Thus the synergy of combining measurement for both tTG and DGP together provides a new level of clinical sensitivity for the detection and monitoring of CD, as well as the differentiation and detection of a growing group of individuals with non-coeliac antibody mediated gluten sensitivity. There is however still a significant possibility of missing Coeliac Disease through some of even these latest laboratory testing methods. Most clinical labs seeking to offer this higher level of testing, measure only a-gliadin out of all the gliadin sub-fractions and transglutaminase-2 out of all the transglutaminases (despite about 50% of patients who react to gluten sub-fractions do so to w– and y-gliadins etc. (not a-gliadin) – and many who produce antibodies to transglutaminase, do so to forms -3 and -6, which correlate with dermatitis and brain function respectively, (and not -2). It is therefore vital to measure antibodies against multiple forms of transglutaminase as it is to measure antibodies against the multiple fractions of gluten. By testing for antibodies to wheat/gluten sub-fractions, associated metabolites, and intestinal barrier proteins, the clinician can quantitatively assess the level of likely damage to this barrier as well as the effectiveness of any treatment protocol. Thankfully, it is now possible to conduct a single blood test that analyses the serum of patients for a number of characteristic components that will assist in the detection and differentiation of Coeliac disease, Non-Coeliac Gluten Sensitivity, Wheat Allergy and IgA insufficiency, in an incredibly diverse range of populations. Note: Assessing both IgA and IgG classes of antibodies together provides a more comprehensive assessment of these highly diverse, elusive and delayed food reactions. It is therefore worth considering testing both IgA with IgG antibodies in all food-based immunological sensitivity assessments. 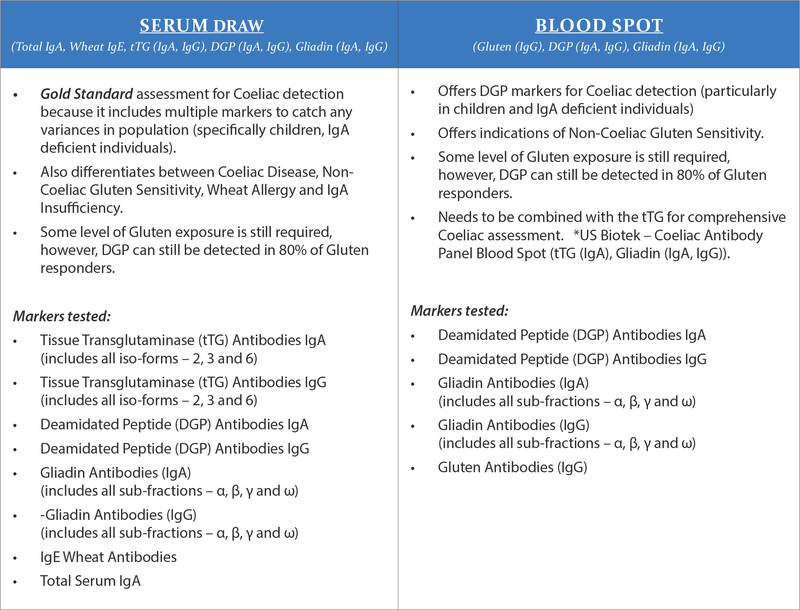 This profile will assist in the clinical differentiation of coeliac disease from both gluten sensitivity and wheat allergy as well as ensuring IgA sufficiency and the validity of the results to a level of sensitivity unachievable through any serological test previously (over 95%). Being able to distinguish between these underlying processes should significantly increase the clinical detection of gluten related pathology and reduce false negatives, maximising treatment possibilities for those requiring a gluten free diet. Atkinson, W et. al. 2004. Food Elimination based on IgG antibodies in irritable bowel syndrome: a randomized controlled trial. Gut. Hodsdon, W, 2010. Reproducibility and Reliability of Two Food Allergy Testing Methods. Natural Medicine Journal, March 2010 Vol. 2 Issue 3. Sollid I et al. 1997. Autoantibodies in celiac disease: tissue transglutaminase-guilt by association. Gut 41: 851-852. Dieterich W. et al. 1997. Identification of tissue transglutaminase as the autoantigen of celiac disease. Nature Medicine 3:797-801. Schmitz J. 1992. Coeliac disease in childhood. In Coeliac Disease. M Marsh, editor. Blackwell Scientific Publications. Oxford, England. Pgs 19-22. Hallert C et al. 1982. Psychic disturbance in adult coeliac disease. III. Reduced central monoamine metabolism and signs of depression. Scand J Gastroenterol 17:25-28. Gobbi G et al. 1992. Coeliac disease, epilepsy and cerebral calcifications. The Lancet 340:439-443. Kinney HC et al. 1982. Degeneration of the central nervous system associated with coeliac disease. J Neurol Sci 5: 9-22. Rubio-Tapia et al 2009. Increased Prevalence and Mortality of Undiagnosed Celiac Disease. Gastroenterology, 137, 88-93.